Enjoy a scenic drive south along the Pan-American Highway to Pisco, the wine capital of Peru. Have your camera handy today as you board your aircraft for a FLIGHT over the Nazca plains, which can only be appreciated by air. Your pilot will point out the mysterious markings known as the Nazca Lines, a series of drawings of animals and geometric figures etched into the parched soil—some up to 1,000 feet long! Theories vary, but the most accepted belongs to German mathematician Maria Reiche, who dubbed the land the “astronomical calendar” of the ancient Peruvians. 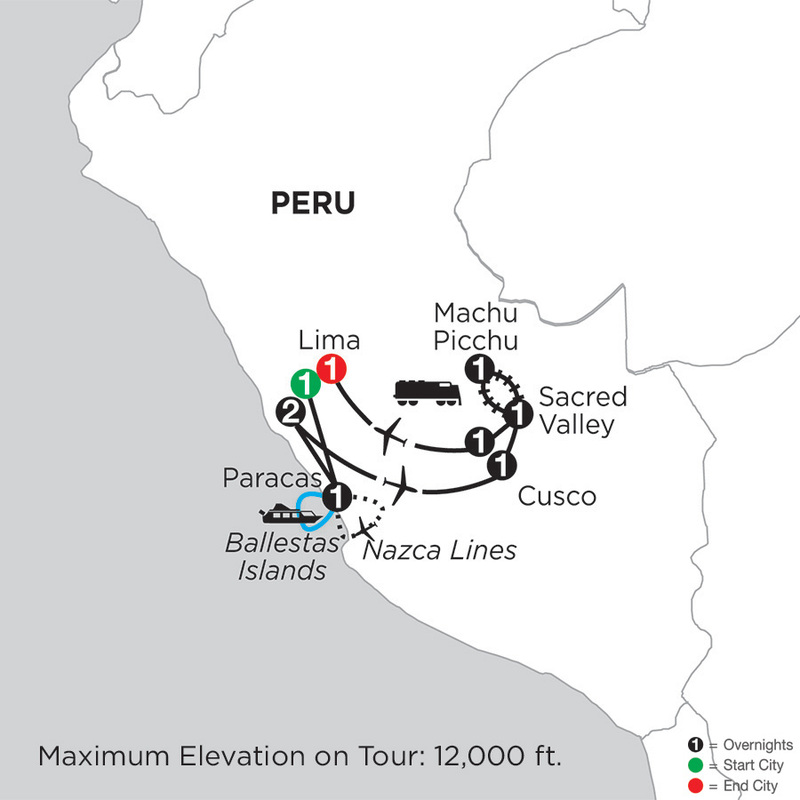 Your included city TOUR focuses on Lima’s rich colonial history as well as the modern city. Lima was the bastion of Spanish South America from its founding in 1535 until the independence of the South American republics in the early 19th century. See the Cathedral, where the remains of Francisco Pizarro are sealed in a wooden coffin the Santo Domingo CONVENT to see the relics of three famous Peruvian saints–Santa Rosa de Lima, San Martin de Porres, and San Juan Macias. Fly to Cusco, high in the Andes. Your guided TOUR visits the Santo Domingo MONASTERY, one of the most important temples devoted to worship of the sun. It is said it was covered in gold leaf and filled with golden representations of nature. At Plaza de Armas, see the cathedral before taking a short drive outside the city to the ruins of SACSAYHUAMAN with its intricate stone walls, the amphitheater of KENKO, and the red fortress of PUCA PUCARA. Today, a short drive into the Urubamba Valley, the Sacred Valley of the Incas, brings you to AWANAKANCHA to learn about the importance of the alpaca (llama) for Inca cultures, as well as the ancient weaving techniques still in use today. Continue to the market town of PISAC, where you can buy handmade rugs, alpaca sweaters, and jewelry at bargain prices. At the other end of the valley, visit OLLANTAYTAMBO to see some of the finest examples of Inca masonry. A morning at leisure allows you to wake up early to see the sunrise over MACHU PICCHU with your second included entrance to the ruins. Return to Cusco this evening, where your Local Host can recommend dining options for your free night.